Samitivej Srinakarin Hospital is a center for advanced medical care. Our teams of medical experts specialize in many different fields. Among these areas of expertise are spinal disorders. 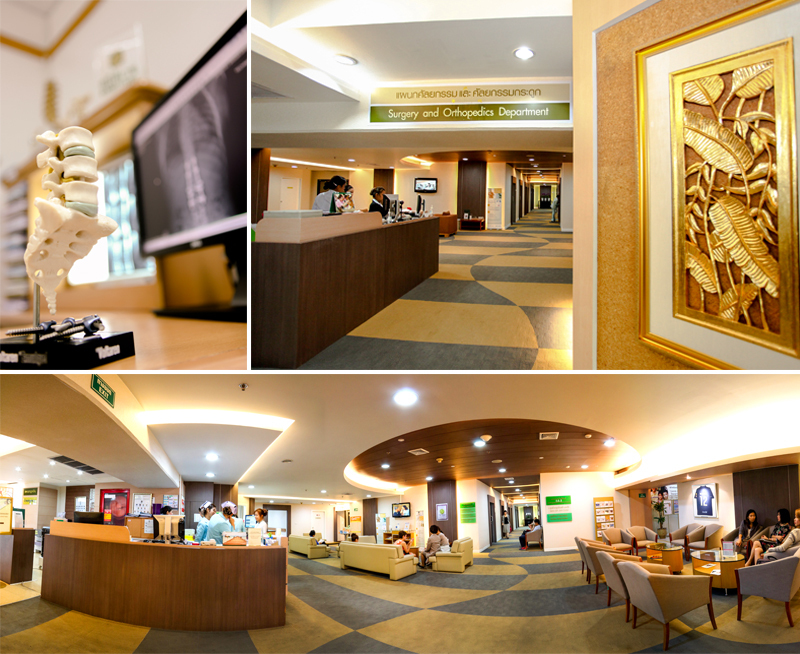 The physicians specializing in spinal disorders at Samitivej Srinakarin are highly-educated and well trained in the care of spinal diseases, experienced and well-respected, both nationally and internationally. We use the latest medical innovations in both the surgical and nonsurgical treatment of spinal conditions in order to achieve the most accurate and effective treatment results. We have a team of doctors and medical staff who specialize in the treatment of scoliosis, both in children and adults. Samitivej Hospital has also established the “Samitivej New Life Fund for Scoliosis” to perform surgeries for underprivileged children suffering from scoliosis. Scoliosis is a spinal deformity that causes the spine to curve to the side, or to curve in an “S” or “C” shape. The term “scoliosis” is from the Greek word meaning “curvature”. The exact cause of scoliosis in children is usually unclear, although genetic predisposition may be a contributor. Possible hormonal imbalances or problems with the nervous system can also be factors. These factors could be why children with scoliosis often do not develop properly, or have muscular or neurological disorders, neurofibromatosis, and a variety of other issues and/or conditions. Scoliosis in adults or degenerative lumbar scoliosis may be due to accidents, fractures, or degenerative changes to the spine. In some cases, it may have been milder and did not show any signs or symptoms during childhood, but then flares up again when the patient becomes an adult, causing severe pain. However, in about 80% of cases, the cause of scoliosis is unknown. This is called idiopathic scoliosis. It is usually found in children ages 10 to 15 years old, which is generally a period of rapid bone growth. Symptoms include curvature of the spine, tilted or uneven shoulders, uneven waistline, leaning to one side, and a bulge or curve on the back, which is why parents often come to see the doctor with concerns about the shape of their child’s body. Only a small percentage of patients experience back pain. Birth to one-year old: This occurs as children are beginning to stand and walk, and 90% of these cases will self-resolve as the children grow. Three to 10-years old: There is an increase in the number of cases in this age range. If the curve is severe and left untreated, children develop long-term problems. Ten to 18-years old: Scoliosis occurs most commonly during adolescence. Mild scoliosis generally does not need treatment. Frequent checkups are advised because the curve may become more pronounced and abnormal, thereby causing impaired physical development. The doctor will measure the curve in degrees. If the patient is under 15 years of age and the curve is somewhere between 30 and 40 degrees, the doctor will advise that the patient wear a scoliosis brace to improve the curvature of the spine. However, if the scoliosis becomes progressively worse, surgery involving metal implants to align the spine will be required. Scoliosis that is present at birth with an unknown cause. These cases may be due to medication taken by the mother during pregnancy and can be the result of bone abnormalities such as an imbalance in spinal growth . Such scoliosis curvature can worsen very quickly and require immediate medical attention. If it becomes severe, paralysis can develop. Scoliosis that develops as children grow, due to some abnormality in the nervous or muscular systems such as brain disorders, cerebral palsy, poliomyelitis, muscular disorders, etc. Scoliosis occurs in 30% of people with neurofibromatosis, which is often seen as raised bumps and/or brown spots on the body. If you notice any abnormal symptoms, you should make an appointment to see a physician in order to diagnose the condition properly, provide the correct treatment approach, and monitor progress to see whether you have any more symptoms in the long term or in the future. Scoliosis, if not properly treated, can worsen and have a variety of negative effects on your health, such as leaning to one side, a drooping shoulder, uneven hips, physical deformities, back pain, problems with the digestive and respiratory systems, becoming breathless or tired easily, pneumonia or lung infection, heart problems, heart failure, and possible pain or complications for women when they are pregnant or giving birth. In cases where the patient has a less than 20 to 30-degree curve, the doctor will usually schedule a follow-up visit for every four to six months. In cases where the curve is greater than 30 degrees, it is recommended that the patient wear a close-fitting cast or brace around the body to re-train the spine and prevent the curve from worsening. The cast or brace should generally be worn for about 23 hours a day and only taken off when showering or bathing. Scoliosis braces should be worn until the patient stops growing, and the number of hours it is worn should be gradually reduced until it is certain that the patient’s spinal curve is no longer increasing. 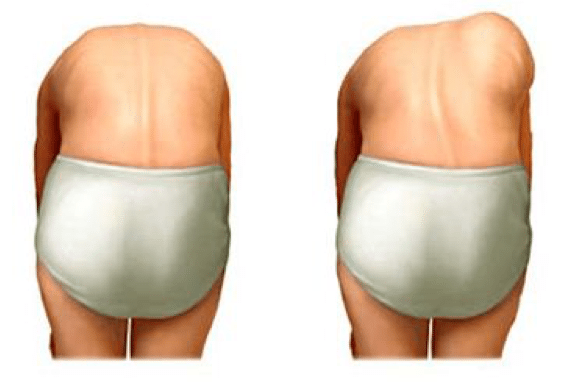 Surgery is used for the adjustment and correction of the spinal curve, in cases where the patient has a curve of greater than 45 degrees and is at an age where they are still growing, or if the curve is more than 50 to 55 degrees and the patient has stopped growing. During the surgery, metal rods are typically attached to the spine and used to hold the spine in place and to align and straighten it. The benefit of surgical treatment is its ability to straighten a curved spine permanently. After surgery, activities that involve spinal movement should be avoided for about six to nine months, such as bending and twisting. After that, the patient can begin to do some exercises that have no risk of injury, such as swimming, walking, etc. However, the cost of surgical treatments are very high, and there is risk of the spinal cord and nerves being stretched or compressed, causing nerve damage. Therefore surgery must only be performed by a specialist with extensive knowledge, experience and expertise. This involves therapists teaching patients what position to be in when they lie down, working with the patient on balancing, learning various exercises to help treat the spinal curve and bring it back into proper alignment, or as close to normal as possible. Treatment varies according to the individual, and this kind of therapy should always be carried out by a physical therapist who has received specialized training for scoliosis, in order to achieve maximum efficiency in treatment. A team of physicians who specialize in all areas related to the treatment of the spine, including rehabilitation medicine specialists and physical therapists who are specially trained and experienced in caring for and rehabilitating scoliosis patients, both before and after surgery. Our doctors will provide patients with close medical consultancy and advice on correct rehabilitation techniques in order to help our patients make steady, continual progress toward total health and wellness. Prof. Emer. 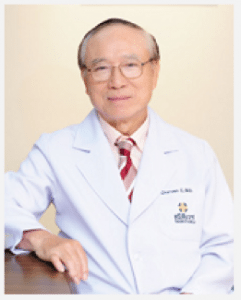 Charoen Chotigavanich, M.D. Clinical Prof. Surin Thanpipattanasiri, M.D. Assoc. Prof. Chatupon Chotigavanichaya, M.D. Asst. Prof. Monchai Ruangchinikom, M.D. Asst. Prof. Visal Kantaratanakul, M.D.